The Matt Garza pending trade to Texas has the feeling of a soap opera. Matt Garza would fit nicely in the Texas Rangers rotation. With the July trade deadline just weeks away, and yet another Texas Rangers starter, Nick Tepesch, hitting the disabled list, this trade board is a little more pitching heavy than the first three versions. While the Rangers front office may not be showing the desperation they are feeling at the moment, you can be assured there are more conversations going on right now than at any other point in previous seasons. There’s no question in my mind pitching is going to be the name of the game for this team going forward. While you can pick up another bat, if you don’t fix the starting rotation, the Rangers will watch the Oakland A’s run away from them in the AL West. Analysis: Alex Rios has moved up my trade board in each week and now finds himself on the very top of the list. While I’ll stop just short of saying his move to North Texas is a foregone conclusion, having a former teammate, catcher A.J. Pierzynski, might sweeten the pot a little bit. Speaking of Pierzynski, he called Rios a little over a week ago and told him the Texas Rangers were trying to acquire him. Not sure if A.J. wanted the conversation to become public, but it’s a little late for that. Here are my concerns about what kind of player Rios is at this point. His numbers with runners in scoring position (.179), runners in scoring position with two outs (.136) and bases loaded (.200) are exactly what the Texas Rangers do not need. Maybe he sees more pitches in this lineup hitting around guys like Nelson Cruz and Adrian Beltre? Analysis: The Texas Rangers can’t keep relying on Joe Nathan, Tanner Scheppers, Robbie Ross and Neal Cotts to keep doing what they’ve been doing over the last month. Ross has started to struggle his last few outings, and Scheppers has looked less than sharp a few times. Texas needs to bring in another reliever to take a little pressure off of the bullpen. I don’t think there’s a better name out there right now than a guy in the Brewers’ bullpen: Francisco Rodriguez. In 19.2 IP he’s given up just two earned runs including just one run given up in his last 10.1 innings. Analysis: The Texas Rangers have had a love affair for Garza since his days with the Tampa Bay Rays, and that love doesn’t seem to have faded. They’ve tried to acquire him before, and I’m too convinced of him becoming a Ranger before July 31 to not have him this high on my list. He’s proven he’s healthy after missing a good chunk of time this season. The biggest question is whether or not the Chicago Cubs are going to ask for the kind of package they sent to Tampa Bay when they acquired Garza a few years ago. If that ends up being a fact, then Texas is going to politely step aside and look at options B, C, D and E. However, I don’t think they’ll get anywhere near what they gave up, making me think Texas will put the kind of package together that will make Chicago agree to a deal. Analysis: The last two starts for Travis Wood have come against AL West rivals of the Texas Rangers (Seattle Mariners, Oakland Athletics). Wood combined to give up just two earned runs in 12.1 IP, including six shutout innings against Oakland, both starts have come on the road, which should say a lot about why he continues to climb up my trade board. I like what this guy brings, and he gives Texas another lefty starter in the rotation, something they could really use with Matt Harrison out until possibly August, if not later than that. Analysis: I’ll give credit where it’s due for this idea. Heard Norm Hitzges of 1310 AM The Ticket here in Dallas mention the idea Sunday morning. While I doubt, very highly, the Braves deal him, I agree with a good friend of mine that, if they do make him available, Texas needs to be in on the conversations. Maholm is a guy I’ve liked since his days with the Pittsburgh Pirates, and I was hoping Texas would be in the mix when he hit free agency. I don’t blame them, however, for holding back, because they weren’t sure what guy was going to show up or if he would have success in the American League. However, Maholm has been solid for Atlanta this season and would be a good addition to this Rangers’ rotation. The concern I have right now is, of his 17 starts this season, 10 of those have lasted six innings or less. Analysis: Yes, Shin-Soo Choo makes a return to my trade board, like he always has since I started doing this list. If I wasn’t so convinced the Rangers wanted Alex Rios, Choo would be the guy I would be clamoring for by July 31. He gives the Rangers everything they need in the lineup, especially hitting around guys like Ian Kinsler, Adrian Beltre, Mitch Moreland, Nelson Cruz and Leonys Martin. If, for any reason, the Reds seem willing to deal him before the trade deadline, I would hope Rangers GM Jon Daniels will work hard at acquiring him. Analysis: Okay, this pick will surprise some people and may not surprise others. You might call him a darkhorse pick at this point, but I think if you don’t land Rios or the White Sox, for whatever reason, decide not to deal him, it might be worth bringing Byrd back to Texas. Byrd is hitting .262 with RISP and .281 with RISP and two outs, numbers that would be favorable in this lineup. So far this season, through 49 at-bats, Byrd has been better in the sixth spot in the lineup (.306/5/11). So, taking that into consideration, imagine Ian Kinsler, Elvis Andrus, Nelson Cruz, Adrian Beltre, A.J. Pierzynski and then Byrd in the six spot in front of Lance Berkman, Mitch Moreland and Leonys Martin. According to Peter Gammons, Tim Hudson has apparently been telling some former teammates he could be traded before the July 31 trade deadline. If that’s the case, Gammons says “watch Texas, Boston and San Francisco.” Hudson is currently 4-7 through 17 starts this season with a 4.72 ERA. If the Rangers don’t get Colby Lewis back, this could be the veteran starter they need to get a very young starting rotation on the right track. Analysis: Jake Peavy threw his first bullpen session for the White Sox on Sunday after being shut down a few weeks ago. While there are certainly going to be concerns over his injury history, there’s no question in my mind, especially if Texas is going to talk to Chicago about Alex Rios, they should try to acquire Peavy in the deal as well. He’s certainly not on the top of the pitching list, but I think he is absolutely worth considering. Analysis: Every time I want to take Ethier off my trade list, I always seem to put him right back on. I’ll keep him at the No. 10 spot on the list for the simple reason I think the Dodgers want to deal him, especially with Carl Crawford about to be activated from the disabled list. And they know they’re going to have to eat most of what’s left on Ethier’s contract (four years $67.5 million + $17.5 million club option) to get anyone interested. The reason I’m going to keep him on my list is I can’t convince myself he can’t or won’t be productive in this lineup. He’s not going to be “the guy,” and they won’t expect him to be the next Josh Hamilton. Put him in a lineup where he’s just another outfielder in his early 30s and I think he can succeed. 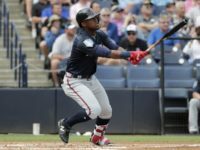 MLB All-Star Game snubs upset first-place Braves; change voting process? Jurickson Profar: The Next Breakout Star in Oakland? Orso Tidbits: Statcast leader Delino Deshields; Most home runs in season by Athletics?